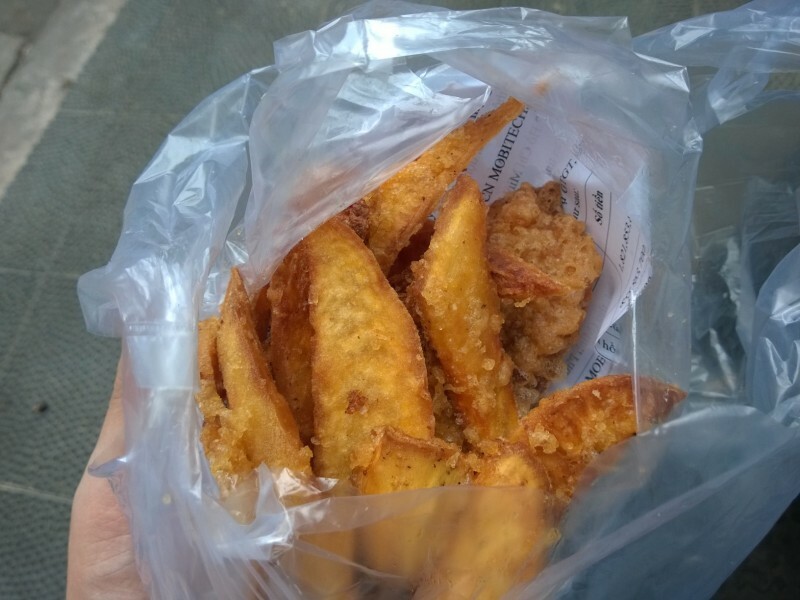 Despite the impression this blog may give, we do consume street food. It’s rarely beautiful – today’s example is vugly too but the deliciousness and value for money more than make up for it. This vendor is a bit far away from the centre of town. 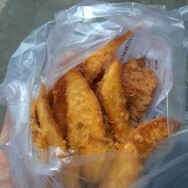 There are street vendors everywhere but not enough deep frying things Iike this, in my opinion. Or I’ve not noticed. Or they’re hiding. The low cost and generous serving sizes still impress me. 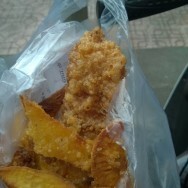 This may at first seem like some classic fish and chip action and sometimes I’d like to pretend I can pick up fish and chips freshly fried on a street before my eyes for about $1 but alas the Vietnamese haven’t caught on to that yet. Instead what we have here are deep fried sweet potato wedges and a banana fritter and they are every bit delicious.